Admit it -- you, me, everyone is obsessed with finding that most elusive of deals: incredibly cheap airfare for our very next trip. And that's no surprise. Clearly, we are a deal-oriented society. I know this firsthand. As a newlywed, I temporarily lost my mind and agreed to accompany my bride to my first-ever "Semi-Annual Sale" at Nordstrom's. My first -- and last. But after the shock of watching elbows fly like a Stanley Cup playoff game wore off, I learned something: There is an art to finding a deal (no Trumpian pun intended). Now let me share what I know about when to find great airfare deals. Let's begin by pointing out that the airlines know a lot about our buying habits. For example, according to travel industry statistics, they know we shop at four to six Web sites before we actually make our airline ticket purchase. They also know we aren't anywhere near as loyal to airlines as we used to be. Our goal: find cheap airline tickets. Airline goal: sell expensive airline tickets. Inflatable fireplace dampers keep your home's warm air from escaping through a fireplace with a leaky metal damper. Pay $50 - $200 once and save on your utilities every year thereafter. A good source for the dampers and for more information go to the chimney balloon site. Get More Out of Your Tube Containers - Toothpaste, Lotions etc. How about a frugal tip to make your lotions, sunscreens, toothpaste and anything that is dispensed from a tube last longer? When it seems you've squeezed the last of what you can get out of that tube, squeeze it downward from the top to be sure you get everything from the top part of the tube down to at least the middle. Then get the scissors and cut a portion of the tube off at the top part. Not the part below where the lotion, etc. comes out. Tei Fu Massage Lotion, which is how she keeps her arthritic joints moving, and tight neck and shoulders relaxed. When I had migraines I used to use it on my temples and neck along the brain stem. So we want to get all we can out of every product we use in a tube. After doing this we still get 4-5 uses, so to keep it from drying out, put a lid on top so air can't get into it. You will find that there is a lot more of whatever was in the tube, settled along the sides and bottom. You can scoop this out and use it. The photo shows one of my wife's favorite products. If you have ever wanted to grow any elderberries that are anti-oxidant-rich 'super-berries' in your own yard, it is easier than you think! Elderberries, aronia berries, currants, and raspberries are all tops in anti- oxidants, as well as vitamins and minerals. It used to be that I would try to find an elderberry bush to gather these purple beauties to make jelly, but they grow in the wild where there is often poison ivy, or I would forget. If you know where a bush is on public land, you may want to plan to gather the deeply reddish-purple power-packed berries before the birds in order to freeze or dehydrate for muffins, make a tincture, or use in a smoothie with honey. We have a dear elderly friend ~from our years on the farm~ named Mary who is 94. She has been picking and making elderberry syrup, jams, and using the berries for muffins and pancakes since she learned it from her mother as a girl. It was a common practice that was felt to give 'vitality and vigor'. The Israelis have researched use for a product named Sambucol (after the Latin name Sambuccus nigra). The purplish-black berries contain potassium and large amounts of vitamin C, and have been proven in quite a few recent studies to shorten the duration of cold and flu symptoms, as well as strengthen the immune system. They contain more ... Read the entire article. Your kitchen is stocked with natural beauty products. To soften skin and exfoliate, pour a gallon of whole milk into a warm bath, then climb in. Remember, Cleopatra did this. Add honey or lavender oil for scent. Or wrap whole oatmeal in a cloth, immerse in warm water and squeeze out several times, then splash your face with the water. Make a scrub by mixing 4 Tablespoons of cornmeal with the juice and pulp of half an orange. Find out how to use common ingredients around the house to make fertilizer for your plants. Ranging from egg shells, coffee, fish tank water, vinegar and more... Read the entire article. Sciddy.com is a place to find U.S. businesses that offer discounts to people 50 years of age and older. Discounts consist of food, entertainment, home services, travel, health, and a whole lot more in hundreds of cities across the country. Our mission is to recognize the largest, most viable buying group in America: seniors. Not only do seniors possess tremendous purchasing power, active lifestyles, and well-defined tastes, they are at the peak of their spending habits. As a result of this, more and more businesses are working to save seniors money. So we dig deep, unearthing the senior discounts available at businesses across the country. We offer a wealth of information that we hope brings a loyal new following to local businesses. We strive to provide the most complete, accurate, and up-to-date listing of senior ... Find Your Discounts. Rechargeable Battery Charges Could Be Draining Your Energy! Many devices now use rechargeable batteries. This can span the range from tools to cell phones and in between. After you have used the devices it becomes necessary to put them in a charger and leave them overnight. Did you know you are wasting energy and driving up your utility costs if you leave them charging after they are charged? Now don't misunderstand, rechargeable batteries are the best option for savings costs. In fact, an independent study conducted for battery manufacturer UNIROSS estimates that using a disposable battery to create 1 kilowatt-hour of electricity has a global warming impact equivalent to driving a car 283 miles; using a rechargeable battery is equivalent to driving 10 miles. Choose an energy-efficient charger. Energy Star-rated models use 35 percent less energy than standard chargers, while solar-powered battery chargers use no electricity at all. For further energy savings, look for a “smart” charger that shuts off when the batteries are fully charged (overcharging shortens battery life). Regardless of charger type, unplug it when it is not being used as it will continue to draw electricity even when not charging. Care for idle batteries. Do not leave batteries uncharged or unused for long periods, which can shorten their life. Remove batteries from infrequently used devices and store away from heat and moisture. Dispose of batteries properly. Rechargeable batteries contain toxic materials and should not be thrown out with regular trash. When purchasing batteries, ask the retailer whether it takes them back for recycling; if it does not, you may be able to bring them to your municipal hazardous waste facility or a local recycling center. Only one thing is certain in this life - we are all going to die. With that said, at the end of our life we will all have a funeral expense. Using green options such as biodegradable coffins and other green measures can help considerably with the expenses. The Green Burial Council, an organization founded to encourage sustainability in the death care industry. This site provides many green resources of common items used in most funerals. Additionally, a wiki article can be found on natural burial too. A good answer to "What is a Green Funeral?" can be found here. Whatever your choice you will need to make it, or someone will make it for you. 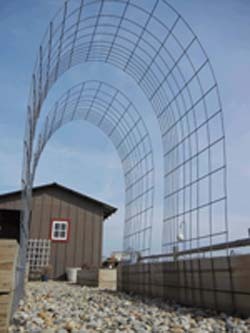 Here is how to build a *simple arched trellis* that will be very strong as well as beautiful. You will leave this trellis in place all year around. It holds up to high winds – we know because we have had ~60 mph winds several times during tornado-like storms. 2 cattle panels side by side arched over between 2 - 4' x 8' boxes. Start with 2 ... Read the entire article. Because of their impacts on both native predators and prey, conservation scientists consider free-roaming cats invasive species. While not the greatest threat to wildlife, they add to the increasingly complex web of existing threats. Species most at risk of death-by-kitty are birds that spend a lot of time on the ground, small mammals and reptiles, according to Temple. In fact, cats are second to habitat destruction as the cause of bird extinction. Thirty-three bird species have met their fate to the paws of cats since the 1600s. The world’s ever-shrinking “islands” of wildlife habitat are hotspots of conservation concern over free-roaming cat populations, since the native species in these areas are the hardest hit by invading cats. For example, birds that live in America’s dwindling grasslands or on the increasingly crowded seashore are finding themselves in a precarious situation. Their dependency on humans highlights another dilemma: free-range cats can easily spread diseases and parasites that can jump from cat to cat, cat to wildlife, and even cat to human. The list of contagions includes feline leukemia, feline immunodeficiency virus, worms, rabies and toxoplasmosis, a parasite-caused disease that can damage the developing brains of unborn human babies, if their mothers are infected. Free-roaming cats’ close proximity to both humans and other animals thus creates a potentially strong reservoir for these diseases. While vaccinating both owned and un-owned cats can help reduce the spread of disease, vaccines are not 100 percent effective and the logistics of vaccinating every single cat may be impossible, especially since many vaccinations are annual. Read the entire article. My family and I love a good danish, but they are very costly to buy from the store. So I came up with this simple and frugal way to make them at home. Enjoy! Seperate bread sticks but do not uncoil, place on ungreased cookie sheet. With your thumb make an indention into the tops of each coil. In a bowl mix cheese, sugar and lemon juice until smooth. Place about 1 tbs. of cheese mix into indentions. Bake at 400 for 15-20 min. Meanwhile combine remaining sugar and milk until smooth. Drizzle frosting over warm danish. Yields 1 dozen. At about $.16 per danish you can't lose. cost - aproximately $4.12 for all ingredients. Fills a 1 Gallon (recycled) Pickle Jar. Mix the apple juice, peanut butter and oil in one container. Mix the oats and brown sugar in another container, until brown sugar is mixed in well. Add in the liquid ingredients and mix well with a spoon until it gets too thick, then I use my hands to mix, like a cookie dough. The granola mixture will be thick. Spread on two cookie sheets, making sure to keep the Granola no more than an inch thick on the pan. Toast the Granola at 225 to 250 in the oven for an hour or so. You want it lightly toasted, not dark brown. You will probably have to turn the granola once during cooking. Keep an eye on it, it might not take the full hour. If you are careful turning you will have both tiny flakes and lumps (the lumps are good for snacking, and the tiny flakes are good for breakfast cereal with milk.) Let the Granola cool and put it in an airtight container. If you wish to add fruit or nuts to this you may, but it makes the cost go up. I use the Crunchy Peanut Butter because it has small pieces of peanuts already in it. In these days of high gasoline prices and long vacation road trips, get ready for high-gear hawking of gadgets that promise more miles per gallon. Some of these gizmos improve mileage by 20 percent or more, promoters claim, by harnessing special science. 'Approved by the Federal Government,' you're told. Breathless customer testimonials for the devices, available online and at select bricks-and-mortar retailers, further bolster the allure. The products typically cost $50 to $250. But buy them and you'll just be taken for a ride, experts say. Read the entire article. This has been happening off and on for years. I believe the FDA is waiting for the public to become numb to the threats of losing supplements, so that nobody responds and they can slide through the laws needed to take away our ability to use natural alternatives instead of drugs that kill more than 100,000 Americans each year, not to mention the compounded diseases created from the side effects of the drugs. Here's an article that explains the problem. You may want to read about the content of the S1310 bill before proceeding with the article below. Please take the time to write your Senator and Congressman. You can write to them from here. The legal drug industry, otherwise known as the pharmaceutical companies, have apparently decided the time is right to eliminate the one threat to their obscene profit margins that still remains. The FDA has issued new regulations that will give it god-like powers to regulate the supplement industry all but out of existence. Nutritional supplements represent a safe and inexpensive method of preventing, curing, and reversing all kinds of debilitating health conditions. The problem here is that there are two troublesome words present in this description – ‘inexpensive’ and ‘preventing’. Both of these concepts are anathema to the pharmaceutical industry, for whom chronic illness and debilitating disease provide tremendous opportunities to make obscene profits. Pharmaceuticals attack illness by attacking the entire body, while supplements help to stave off illness by helping people improve their health and boost their own immunity. The latter is clearly superior to the former, and any sane health care system would emphasize prevention and cost containment above all else. But that would not be good for the pharmaceutical companies, whose source of money and power would dry up if people got healthy without their “help”. Of course their products kill more than 100,000 Americans every year, but we are not supposed to mention that inconvenient fact. For those who would argue that the FDA is taking this action simply because it wants to protect the public from unscrupulous operators who want to exploit people’s interest in natural remedies, there are two aspects of this new policy that prove conclusively what the FDA’s agenda really is. First, the requirement that nutritional manufacturers prove the safety of the ingredients they sell actually applies to companies, not ingredients. What does this mean? Simply this – if Company A and Company B both use the same new ingredient in their products, it will not be enough for Company A to submit evidence proving conclusively that this ingredient is safe and effective. Even if Company A gains approval for one of their supplement (fat chance, but for the moment let’s pretend), Company B will still have to apply for an NDI permit for the same ingredient – and they will have to present separate evidence to prove its safety and efficacy! This shows clearly that the point of these regulations is to cause hardship for nutritional companies, not to protect the safety of the public. For those who need even more decisive evidence, however, here it is – synthetic versions of natural ingredients, produced in the laboratories of pharmaceutical companies who want to steal supplement business by turning natural ingredients into drugs, will be completely exempt from these new testing and reporting regulations. So there it is – if the pharmaceutical companies want to sell fake, drug-like versions of the real thing to get in on a profitable game, they will not be required to prove that their synthetic creations are safe. If there were any doubts left about who is really pulling the strings in this latest FDA power play, this should erase them. Read the entire article.